Discover the Alhambra with direct transfers from different Andalsuian cities. We offer guided tours from the Costa de Sol, Malaga City, Seville, Granada Province and more with destination to Granada. The tour includes return transport, the official Expert Guide and the Alhambra Tickets to all parts of the monument. 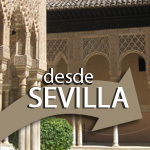 We connect Sevilla with the Alhambra! Book comfortably your transfer from Seville to most important monument of Spain, the Alhambra of Granada. We will pick you up in the morning from your hotel in Seville and take you to Grananda following the route of Washington Irving. The tour includes the Alhambra tickets for all parts of complex and the local Expert Guide. In the afternoon, you will have time to relax and enjoy the Andalusian landscape on the way back to Seville. We share our most beautiful monument with the Malageños! 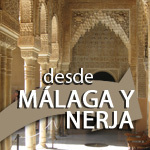 Check out our frequente tours from Malaga to the Alhambra. The perfect option to escape on a full day trip to Granada and contemplate the astonishing Alhambra and Granada`s historic city centre. We will pick you up in the morning from your hotel and bring your directly to the main entrance of the Alhambra. Once arrived, the Expert Guide with your Allhambra Tickets will welcome you. In the afternoon, there will be some time off for lunch and shopping. From the cruiser to the Alhambra! 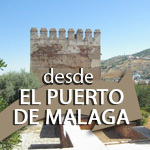 Once arrived to Malaga Harbour we will pick you up and take your directly to Granada. Discover the Alhambra during the morning tour and explore the streets of Granada in the afternoon. With our special cruise time tables you will have enough time to enjoy the city of Granada and the Alhambra and return on time to your cruiser. From the beach to the Alhambra! Escape for a day and visit the Alhambra with Tickets, Transport and Expert Guide included. We pass several coastal cities such as Torremolinos, Fuengirola or Benalmadena on our way to Granada. 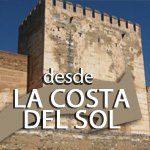 In the afternoon we return to the Costa de Sol and leave you at your hotel. 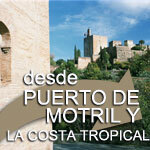 We offer exclusive transfers from Marbella and San Pedro directly to the Alhambra of Granada. The Tour includes the local Expert Guide of the Alhambra and Generalife, the Alhambra tickets to all parts of the monument and return transport. Later on you will have some time for lunch and shopping the historic city centre of Granada. Afterwards we will return to San Pedro and Marbella. 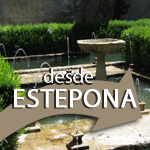 Of course, we also pass Estepona on our Alhambra Tour. Seize the opportunity to escape on a full day trip to Granada. The Alhambra Tour includes return transport, the Alhambra Tickets for all parts of the monumento and the guiding by a local expert. During the afternoon you will have some time for lunch and resting. In the early evening we start the return tour to Estepona. Staying at Granada`s coast? No problem! We pass Herradura, Almuñecar, Salobreña and Motril on our tour to Granada and the Alhambra. The Alhambra tour, including Alhambra tickets and the Expert Guide, starts in the morning and finishes aprox. between 2.5 and 3 hours later. Enough time to go for lunch or doing a shopping tour in the city centre of Granada. Later in the afternoon return in direction to the coast following the reverse route. 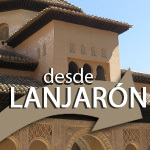 From Lanjaron we offer daily Alhambra Tours. In just half an hour you will arrive comfortably in Granada. We will stop directly in front of the Alhambra, hand in your Alhambra tickets and guide you through the whole complex. During the afternoon you will have time for some lunch and shopping. The Alhambra Tour can start! 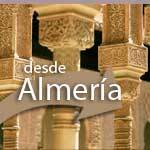 We connect the coast of Almeria with the Alhambra! Book comfortably your transfer from Almeria to most important monument of Spain, the Alhambra of Granada. We will pick you up in the morning from your hotel in Almeria and take you to Granada through the Tabernas Desert. The tour includes the Alhambra tickets for all parts of complex and the local Expert Guide. In the afternoon, you will have time to relax and enjoy the Andalusian landscape on the way back to Almeria.